The Crown Prosecution Service (CPS) is to contact defendants in 25 cases where evidence was given by journalist Mazher Mahmood. They will be provided with a "disclosure pack" which "they may consider undermines the conviction in a specific case," a spokesperson said. 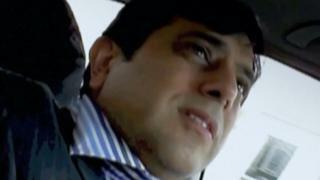 Three live cases where Mr Mahmood - dubbed the Fake Sheikh - was due to give evidence have also been dropped. Mr Mahmood has previously said he used legitimate investigatory methods. The decision to contact defendants was made after the CPS reviewed prosecutions following the collapse of the trial of former X-Factor judge Tulisa Contostavlos in July. The judge in that case said there were strong grounds for believing that Mr Mahmood had lied at a hearing before the trial started. Subsequently, in a BBC Panorama investigation, one of Mr Mahmood's former colleagues at the News of the World claimed that they created elaborate stings to target celebrities unfairly. As a result, former attorney general Lord Goldsmith told the same BBC programme that Mr Mahmood's record needed to be re-examined. Lawyer Mark Lewis has been contacted by 16 people over possible civil claims against Mr Mahmood, including some not convicted of a crime. He predicted that payouts to alleged victims if convictions are overturned could be "in financial terms, bigger than phone hacking ever was" because people have "lost their livelihoods, their homes and their incomes". Mr Mahmood has previously said he has spent his career investigating crime and wrongdoing through legitimate investigatory methods, bringing many individuals to justice. He said any criticism of him usually came from those he had exposed or people he had worked with who had an "axe to grind". He is currently suspended from the Sun on Sunday following the collapse of Ms Contostavlos's trial. A spokeswoman for the Sun said: "We are aware of the CPS statement. Mr Mahmood remains suspended and we are continuing our internal investigation into the matter." A CPS spokesman said on Thursday that no defendants were currently in custody in cases involving Mr Mahmood. In three live cases, prosecutors decided there was not a realistic prospect of conviction. The spokesman added: "We are now considering past cases which resulted in a conviction in criminal courts in England and Wales based on evidence provided by Mr Mahmood, and have identified 25 cases. "As part of this process, over the coming weeks, CPS Areas will be contacting representatives of the defendants - or defendants themselves as necessary - convicted in these cases in order to provide them with a disclosure pack - details of material which they may consider undermines the conviction in a specific case." In September, several cases involving evidence from Mr Mahmood were halted. The CPS offered no evidence against Dr Majeed Ridha and pharmacist Murtaza Gulamhusein, who were accused of illegally supplying an abortion drug. Leon "Starino" Anderson and co-defendant Ashley Gordon also had drug charges dismissed.